As a guitar teacher I regularly introduce my students to different effects and pedals. Out of all the pedals and effects available for guitarists, there are always two pedals that receive the best reactions from students: the wah and the Whammy. The first time a student plays the wah or Whammy, it suddenly opens up their playing to new ideas and inspiration. If you haven’t played with a Whammy before, read through this review and get yourself one. I consider it to be one of the essential effects every guitarist should have (others include a wah and looper pedal). If you own a whammy pedal but aren’t sure how to get the most out of it, check out my Whammy pedal lesson here. The original DigiTech Whammy was released in 1989 and inspired a large range of 90s guitarists through to today. The Whammy DT (link to Amazon for price and full details) came out in 2011 so while it’s already a few years old as of this review, it’s still seen as the top pick out of the Whammy lineup in terms of features. To the left of the expression pedal, you will see a range of LEDs for different whammy settings. The whammy effects allow you to bend your guitar notes up or down based on different intervals. For example, you can set it to one octave higher, a fifth higher, a fourth lower, etc. The basic idea is that when the pedal is in the heel position, your signal is untouched. As you roll the pedal forward, it will bend the note (or chords) up or down based on your setting. 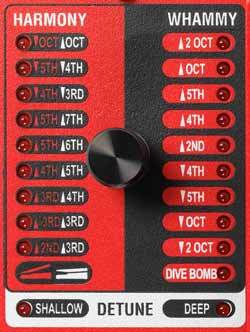 The 10th setting is ‘Dive bomb’ which simulates what you would be able to do if your guitar has a tremolo arm. The lower right ‘Whammy’ footswitch enables/disables this effect as well as the harmony or detune effects mentioned below. The harmony settings are similar to the whammy settings, but instead of bending the original signal up or down, it creates a harmony on top of your signal. You can also use the pedal to glide back and forth between two different pitch shifting intervals. So you could set it so when the pedal is in the heel position it will play a harmony an octave lower then as you roll to the toe position, it will glide the harmony up until it reaches an octave higher. Other combinations such as 4th above (heel) and 5th above (toe) are possible. In addition to bending your tone up or down or creating a harmony, there are two additional ‘detune’ effects. This effect is similar to a chorus or ensemble effect where your tone is subtly raised and lowered to create a warbling sound. The expression pedal controls how much of this effect is produced. Two settings are available: ‘shallow’ or ‘deep’ based on how subtle or exaggerated you want the effect to be. To the right of the expression pedal, you will see another range of pitch shifting with a separate footswitch. 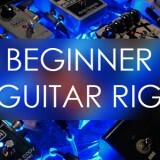 This area allows you to shift your guitar’s signal up or down one semitone at a time until you’re either up or down an entire octave. The easy way to think about this is to imagine that you can use the pedal to detune your guitar (eg: from E down to D) or you can use it as a ‘virtual capo’ by shifting the pitch higher. You can even mix an octave above or below with your original signal. This feature doesn’t make use of the expression pedal so the effect is instant when you hit the footswitch. After the Whammy DT came out, DigiTech took the Drop Tune feature and created a standalone pedal for it called the DigiTech Drop which I reviewed here. The drop tune effect can be enabled/disabled with the ‘Drop Tune’ footswitch. You can also control the effect with the ‘Momentary’ footswitch which only activates the effect while it is held down. This allows you to rapidly enable/disable the drop tune effect with speed and control. This feature was also carried over to the DigiTech Drop pedal and allows you to produce interesting rhythmic effects with pitch shifting not possible on other whammy pedals. The Whammy DT can be controlled via MIDI which is useful if you use a lot of different pitch based effects and don’t want to constantly tweak the knobs during a gig. Alternatively, you can connect an external footswitch to allow you to switch between different settings without using your hands. It’s important to note that the Whammy DT is fully polyphonic which means you can play full chords and expect each individual note to properly shift up or down without problems. Older whammy pedals and other pitch based pedals often struggle to shift more than a few notes at once so this is an important feature. This pedal crams a lot of features in and quite often that means that you will need to check out the manual to figure out all the functions. Fortunately, the DT is very self-explanatory. Within five minutes of playing around with the switches and pedal you will know how to dial in all the different settings. The individual LEDs tell you at a glance what pitch setting you’re on and all you need to do is turn the relevant knob to move between the settings. So if you want to switch from an octave up whammy effect to an octave harmony effect, you simply turn the knob until the right LED lights up. My students had no problem setting up the right pitch settings. The pedal is well designed and the Whammy and Momentary footswitches are in ideal positions. If you use the Drop Tune footswitch, you’re likely to leave it on or off for an entire song so it doesn’t matter that it’s higher up the pedal. The important thing is that the momentary footswitch is easily accessible. Some of my students play a lot of songs in drop tunings (eg: Drop D, Drop B) and it’s incredibly easy to use the Drop Tune section to shift the pitch down as needed to the correct pitch. Older whammy pedals and cheap pitch based pedals often sound artificial. Bad sounding pitch pedals due to old technology has given digital pedals a bad reputation. The Whammy DT is an incredibly natural sounding pedal and does not sound ‘digital’ in any way when used properly. It’s one of the best sounding pitch effects I’ve heard recently along with the newer DigiTech Drop because DigiTech knows how to deal with pitch effects properly. When using the Drop Tune feature, it sounds almost identical to a guitar tuned down. Of course the further down you go in pitch the less clarify you will hear, but it’s still high quality. Sometimes I hear people bass guitarists complain that it produces an artificial sounding tone when tuned down more than a few semitones. There’s always going to be a big difference between a detuned bass and a pitch-shifted bass. That’s not due to the pedal, that’s physics. So if you’re a bass player considering this pedal (or the Drop) to detune your bass, while there are whammy pedals designed for bass guitars, you’re unlikely to ever find a perfect result. The first thing players often do (and what my students do) when they first play a whammy is to set it to an octave higher and push the expression pedal back and forth to get a waaaaaeeeeeee waaaeeee sound. The solo in Like a Stone by Audioslave (guitarist Tom Morello) is a classic example of how the whammy can be used. But that’s only just the beginning. Tom Morello often combined the whammy with his wah pedal to produce outrageous effects. In my guide to Tom Morello’s RATM rig (and Audioslave rig here), I explain how the Whammy is an essential effect to replicate his tone. Other guitarists such as Dimebag Darrell, Steve Vai, Joe Satriani, David Gilmour, and Jack White have used the whammy in different ways throughout their careers. Whether you set the pedal to a harmony, use it as an octaver or create space like effects when combined with delay, chorus or wah pedals, there are so many different sounds you can get out of the whammy. A great example of very subtle and melodic use of the Whammy can be heard in Marooned by Pink Floyd. If you’re a David Gilmour fan, it’s worth checking out as well as The Blue from his solo album On an Island. Check out my David Gilmour gear guide for more information on the effects he uses. 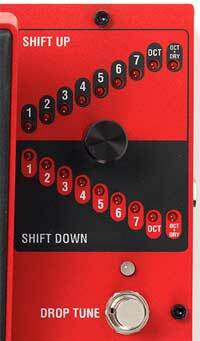 Very similar to the original DigiTech Whammy, the DT is a big red metal box that looks like it could easily take a beating and survive. The two black knobs are positioned in a way that I never feel like I’m going to accidentally hit them and even if I did, they feel solid. It is a quite large pedal, but when you consider the range of effects you can get out of it, it definitely earns its space on a pedalboard. I highly recommend every guitarist own a whammy, a wah, and a looper. Those are essential effects that can give you so much inspiration and freedom as a guitarist. Even if you don’t usually listen to the style of music where whammy pedals are used, you will find your own creative uses for it. There are quite a few whammy pedals available and I highly recommend the Whammy DT as the one to buy because of the range of features it packs into one pedal. You may consider the Whammy V, but as I explain below, the DT has more features. 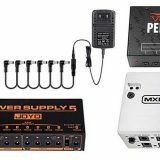 If you already own an older whammy, this is worth considering as an upgrade. Alternatively, if you’re happy with your existing whammy, consider adding the DigiTech Drop to your pedalboard to achieve a similar range of effects. 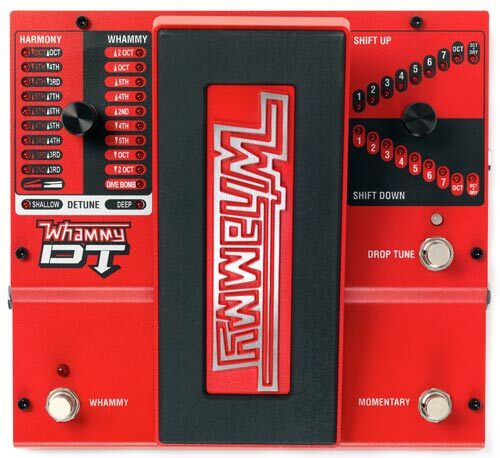 Check out the price and more details on the Whammy DT here (link to Amazon). Who is the Whammy DT for? Almost all of my students enjoy using the Whammy even if they don’t like the style of music Whammy players such as Tom Morello tend to play. The fact that quite a few of my students have bought a Whammy yet they all play different styles gives me the confidence to recommend this for almost all guitarists. Who isn’t the Whammy DT for? Acoustic guitarists could use this as well, but unlike other pedals (eg: delay, chorus, reverb) that sound good when you hear them blended with your guitar’s resonance, hearing a pitch-shifted guitar blended with the natural resonance of your guitar will be a nightmare unless you play with headphones. 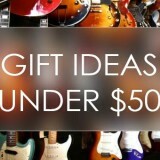 That means the Drop Tune feature isn’t going to be as useful to you as it is for an electric guitarist. So if you’re an acoustic guitarist, just remember that while you will hear the pitch change from your amplified signal, you will still hear your unaffected pitch from your guitar and it won’t be pretty. It would work well in the studio, but at home or live it’s likely to annoy you. Combine the Whammy DT individually with other effects such as slapback delay, a looper, chorus or flanger. Each combination will get you to think in new ways and come up with creative licks and riffs. Set the whammy to harmony mode then use the wah as normal. This is similar to what Tom Morello often does. Sit in a chair and use one foot on the wah and your other foot on the whammy expression pedal in whammy mode. It’s a bit of fun but make sure nobody is watching! Use the Drop Tune to detune your E string down to a B so you can play songs that were originally meant for a seven string guitar. Simply hold down the momentary switch for sections that use the low B string and step off the switch to play on the higher strings. Or use the Drop Tune footswitch as needed. 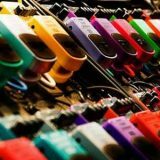 There are plenty of alternatives to the Whammy DT – mainly other DigiTech products either older (eg: Whammy IV) or newer (Whammy V). In all honesty, I feel the DT is the best out of the range thanks to the Drop Tune features and the momentary switch. Instead of only having an expression pedal, it gives you different ways to achieve the same effects. A few people have asked how the DT compares against the Morpheus Droptune. I don’t think there’s any comparison. A closer comparison would be the Morpheus Droptune vs the DigiTech Drop and even then I think the DigiTech comes out ahead. The main reason is that the Morpheus Droptune doesn’t have any of the whammy functions or an expression pedal. It only gives you the drop tuning abilities. The Whammy 5 is newer than the DT so while it may be using better technology and may sound better (I haven’t A/B tested them unfortunately), it does miss out on the Drop Tune features. So while you will definitely get a great sounding Whammy if you buy the Whammy V, you’re going to be limited to only using the expression pedal and miss out on the drop tuning or the momentary switch. In my view, that’s missing out on a lot. While you could always add those features in with the DigiTech Drop, having it all in one pedal is a great advantage. Check out the Whammy 5 here. If you like the idea of the drop tuning effect but aren’t interested in the expression pedal, harmony or whammy effects (are you crazy!? ), the DigiTech Drop is a standalone stompbox that gives you that effect. Read my review on the DigiTech Drop here to get an idea what it can do for you.